Evaluation of the patient with dizziness begins with careful history taking and a complete neuro-otologic physical examination, including vestibular examination. The history is critical and should focus on the nature of the symptoms, the duration, and triggering or alleviating factors. Ask patients to describe their symptoms by using words other than “dizzy.” The rationale for using other words is that patients may use dizzy nonspecifically to describe vertigo, unsteadiness, generalized weakness, syncope, presyncope, or falling. Dizziness includes light-headedness, unsteadiness, motion intolerance, imbalance, floating, or a tilting sensation. It is essential to distinguish vertigo, which is a subtype of dizziness defined as an illusion of movement caused by asymmetric input to the vestibular system, from other types of dizziness. This dichotomy is helpful because true vertigo is often due to inner-ear disease, whereas other symptoms of dizziness may be due to central nervous system (CNS ), cardiovascular, or systemic diseases. Sudden onset and vivid memory of vertiginous episodes are often due to inner-ear disease, especially if hearing loss, ear pressure, or tinnitus is also present. Gradual and ill-defined symptoms are common in CNS, cardiac, and systemic diseases. Central vertigo secondary to brainstem or cerebellar ischemia usually lasts for 20 minutes to 24 hours and is often associated with other brainstem characteristics, including diplopia, autonomic symptoms, nausea, dysarthria, dysphagia, or focal weakness. Patients with cerebellar disease are frequently unable to ambulate during acute episodes of vertigo. Patients with peripheral vertigo can usually ambulate during episodes and are consciously aware of their environment. A history of headaches, especially migraine headaches, can be associated with migraine-related dizziness. Previous viral illness, cold sores, or sensory changes in the cervical C2-C3 or trigeminal distributions usually indicate vestibular neuronitis or recurrent episodes of Ménière disease. Dysdiadochokinesia and gait ataxia during episodes are more likely to be due to cerebellar diseases, especially in the elderly and in subjects with evident cardiovascular risk factors. Progressive gait difficulty, memory loss, and urinary incontinence are commonly due to normal pressure hydrocephalus (NPH). Sensory and motor symptoms and signs are usually associated with CNS diseases. The history should include a review of systems (especially head trauma and ear diseases, trauma, or surgery). The impact of dizziness on activities of daily living at work and home should be addressed. Screening for primary or reactive anxiety and depression is important. A history of prescription medicines, over-the-counter medications, herbal medicines, and recreational drugs (including smoking and alcohol) can help to identify pharmacologically induced syndromes. To diagnose dizziness, physicians must use the essential tools of history, clinical examination, and follow-up. The etiology in most of these patients mainly involves a vestibular disorder, such as BPPV, Ménière disease, or bilateral vestibular hypofunction. Appropriate management and follow-up are necessary to improve the well-being of these patients. In patients with dizziness, the general examination should emphasize assessment of vital signs, supine and standing blood-pressure measurements, and evaluation of the cardiovascular and neurologic systems. Examine the ears for visible infection or inflammation of the external or middle ear. Test hearing and discrimination by using a tuning fork and by whispering and asking the patient to repeat heard words. Examine the neck for range of motion and flexibility. Focused neurologic examination of the cranial nerves, motor and sensory modalities, gait, and stance is important in the initial visit. Cerebellar tests, especially failure of fixation suppression (FFS) of vestibular eye movements, are important for checking the vestibulocerebellum. Failure of fixation suppression (FFS) can be tested by asking the patient to stretch his arms and look at his thumb while being passively rotated (manual rotation of examination chair). A visible nystagmus (right or left) indicates FFS that is always central in origin. A robust oculocephalic reflex and intact visual acuity with active head movements (dynamic visual acuity) reflect good VOR. Absence of the oculocephalic reflex or a decrease in visual acuity with head movements reflects decreased vestibular function. Nystagmus observed under Frenzel glasses after rapid head shaking reflects asymmetric vestibular input. Nystagmus, whether spontaneous, gaze-induced, or positional, must be completely characterized to be correctly interpreted. This characterization should include provocative factors, latency, directions, effects of gaze, temporal profiles, habituation, fatigability, suppression by visual fixation, and accompanying sensation of dizziness. Failure to fully characterize nystagmus can lead to misdiagnosis. Examine eye movements for evident oculomotor abnormalities, especially nystagmus. Spontaneous, gaze-evoked, post head shake, and post mastoid vibration are important to elicit, observe, and document. Differentiating peripheral from central nystagmus is key. Central nystagmus is a purely horizontal or vertical and not suppressed by visual fixation. Peripheral nystagmus is usually rotatory and most evident with removing visual fixation (eg, by using Frenzel goggles or infrared video nystagmography; see the images below). It also obeys the Alexander law; that is, the intensity of nystagmus increases with gaze in the direction of the fast phase. Post head shake and mastoid vibration nystagmus is usually a reflection of uncompensated unilateral vestibular hypofunction. 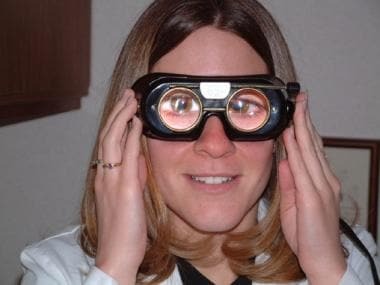 Example of Frenzel goggles used for evaluation in neuro-otology clinic. Typical example of computer and headgear equipment used in neuro-otology clinic. The positioning examination (Dix-Hallpike test) is important for identifying BPPV commonly caused by otolith debris (canalith) floating in the semicircular canals (canalithiasis) or adhering to the cupula (cupulolithiasis). This maneuver is performed by guiding the patient rapidly from a sitting position with the head turned 45° to one side to a supine position. For torsional nystagmus, observation or video recording is more sensitive than electronystagmography (ENG). BPPV is due to posterior semicircular canal canalithiasis about 90% of the time. Typical nystagmus related to posterior semicircular canal benign positioning and its symptoms are delayed by several seconds (latency). They peak in 20-30 seconds and then decay (paroxysmal), with complete resolution of symptoms while the patient maintains the same head position (habituation). Symptoms and reversed nystagmus may occur when the patient is brought back to a sitting position. Therefore, benign positioning nystagmus is latent, paroxysmal, geotropic, reversible, and fatigable. The vertical component of benign positioning nystagmus is best observed by asking the patient to move the eyes away from the downward ear to determine whether the vertical component of nystagmus is due to the down posterior canal or the contralateral uppermost anterior canal (rare). Caloric testing can be done as part of the bedside examination. After checking both ear canals for tympanic perforation and wax, instill 1 mL of water at 30°C. 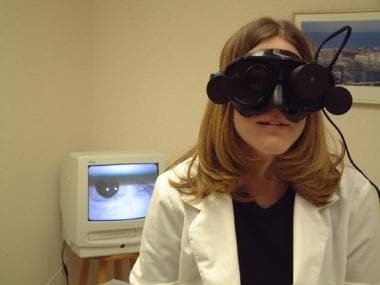 Observe the nystagmus response by using Frenzel goggles or an infrared video system. In this way, dizziness, the duration and intensity of the nystagmus, and visual fixation suppression can be evaluated. The VSR can be examined with Romberg, tandem gait, and Fukuda stepping tests. These tests provide information about the patient’s postural stability when visual and proprioceptive inputs are removed. The experienced physician can observe the patient’s postural stability, limits of stability, and strategy of movement at the limits of stability. Clinical testing of postural stability is qualitative and requires both experience on the part of the examiner and cooperation on the part of the patient. Ask the patient to run the heel repeatedly from the opposite knee down the shin to the big toe, and look for incoordination. Watch the patient walking, performing tandem gait. The normal gait is characterized by an erect posture, moderately sized steps, and the medial malleoli of the tibia tracing a straight line. To conduct the Romberg examination, ask the patient to stand with the heels together, first with eyes open, then with eyes closed. Then, ask the patient to stand on a high-compliance surface and note any excessive postural swaying, either posteroanteriorly or to one side. After Romberg examination, ask the patient to step in place for 30 seconds and observe poststepping position drift from midline. If positive, it reflects an uncompensated unilateral vestibular hypofunction. The Hamid vestibular stress test is composed of a sensory and a motor component and is performed by using a high-compliance foam pad (HCFP). The examination is simple, easy to administer, and applicable to most patients with dizziness and disequilibrium. In the sensory component, the patient stands on the HCFP with eyes open and arms stretched out while the examiner observes the degree of sway in the primary position and at the limits of stability. The patient then tilts the head back and moves it right and left, first with eyes open and then with eyes closed. The examiner must be prepared to catch the patient if he or she falls. Experience with this examination has shown that patients cannot stand on the HCFP with eyes closed and head tilted back unless they have an intact vestibular and balance system. The response pattern is repeatable and physiologic. It demonstrates the physiologic postural reaction and the switch between ankle and hip-sway strategies expected at the limits of stability. Patients with peripheral and central dysfunction have patterns that do not include quick and corrective movements, performing a hip-sway, or taking a step. Of course, this examination is qualitative and subject to the physician’s experience and the patient’s musculoskeletal condition and ability to cooperate. If the results of vestibular examination are normal, hyperventilation for 2 minutes is helpful in identifying patients with hyperventilation syndrome. This should be done in the sitting position. Hyperventilation must be done while the physician monitors for nystagmus by using Frenzel goggles or an infrared video system. Hyperventilation can accentuate both central and peripheral vestibular dysfunction and reproduce dizziness and neurologic symptoms due to either true pathology or underlying anxiety or stress. Kerber KA, Meurer WJ, West BT, Fendrick AM. Dizziness presentations in U.S. emergency departments, 1995-2004. Acad Emerg Med. 2008 Aug. 15(8):744-50. [Medline]. Saber Tehrani AS, Coughlan D, Hsieh YH, Mantokoudis G, Korley FK, Kerber KA, et al. Rising annual costs of dizziness presentations to U.S. emergency departments. Acad Emerg Med. 2013 Jul. 20 (7):689-96. [Medline]. Olsson Möller U, Midlöv P, Kristensson J, Ekdahl C, Berglund J, Jakobsson U. Prevalence and predictors of falls and dizziness in people younger and older than 80 years of age-A longitudinal cohort study. Arch Gerontol Geriatr. 2012 Sep 18. [Medline]. Trune DR. Ion homeostasis in the ear: mechanisms, maladies, and management. Curr Opin Otolaryngol Head Neck Surg. 2010 Oct. 18(5):413-9. [Medline]. [Full Text]. Navi BB, Kamel H, Shah MP, Grossman AW, Wong C, Poisson SN, et al. Rate and predictors of serious neurologic causes of dizziness in the emergency department. Mayo Clin Proc. 2012 Nov. 87(11):1080-8. [Medline]. Katsarkas A. Dizziness in aging: the clinical experience. Geriatrics. 2008 Nov. 63(11):18-20. [Medline]. van Leeuwen RB, Bruintjes TD. Dizziness in the elderly: diagnosing its causes in a multidisciplinary dizziness unit. Ear Nose Throat J. 2014 Apr-May. 93(4-5):162, 164, 166-7. [Medline]. Lüscher M, Theilgaard S, Edholm B. Prevalence and characteristics of diagnostic groups amongst 1034 patients seen in ENT practices for dizziness. J Laryngol Otol. 2014 Feb. 128(2):128-33. [Medline]. Fakhran S, Alhilali L, Branstetter BF 4th. Yield of CT Angiography and Contrast-Enhanced MR Imaging in Patients with Dizziness. AJNR Am J Neuroradiol. 2012 Oct 25. [Medline]. Murofushi T, Shimizu K, Takegoshi H, Cheng PW. Diagnostic value of prolonged latencies in the vestibular evoked myogenic potential. Arch Otolaryngol Head Neck Surg. 2001 Sep. 127(9):1069-72. [Medline]. Walker MF. Treatment of vestibular neuritis. Curr Treat Options Neurol. 2009 Jan. 11(1):41-5. [Medline]. Fife TD, Iverson DJ, Lempert T, Furman JM, Baloh RW, Tusa RJ, et al. Practice parameter: therapies for benign paroxysmal positional vertigo (an evidence-based review): report of the Quality Standards Subcommittee of the American Academy of Neurology. Neurology. 2008 May 27. 70(22):2067-74. [Medline]. Honaker J, Samy RN. Migraine-associated vestibulopathy. Curr Opin Otolaryngol Head Neck Surg. 2008 Oct. 16(5):412-5. [Medline]. Lempert T, Olesen J, Furman J, et al. Vestibular migraine: diagnostic criteria. J Vestib Res. 2012. 22(4):167-72. [Medline]. Jen J, Kim GW, Baloh RW. Clinical spectrum of episodic ataxia type 2. Neurology. 2004 Jan 13. 62(1):17-22. [Medline]. von Brevern M, Ta N, Shankar A, et al. Migrainous vertigo: mutation analysis of the candidate genes CACNA1A, ATP1A2, SCN1A, and CACNB4. Headache. 2006 Jul-Aug. 46(7):1136-41. [Medline]. Carlson ML, Tveiten OV, Driscoll CL, Neff BA, Shepard NT, Eggers SD, et al. Long-term Dizziness Handicap in Patients with Vestibular Schwannoma: A Multicenter Cross-sectional Study. Otolaryngol Head Neck Surg. 2014 Oct 1. [Medline]. Sacco RR, Burmeister DB, Rupp VA, Greenberg MR. Management of benign paroxysmal positional vertigo: a randomized controlled trial. J Emerg Med. 2014 Apr. 46(4):575-81. [Medline]. Hamid MA, Samy HM. Vestibular and Balance Rehabilitation. Hamid M, Sismanis A, Eds. Medical Otology & Neurotology. New York, NY: Thieme; 2006.